It’s Spring! Time to get outside and shake off the winter. Telephone poles are plastered with tag sale signs and the outdoor flea markets are slowly returning. We were lucky this year it never got too cold and we had below average snowfall but I know I still had a bout of cabin fever and I am happy for the warmer weather. The table top/wall art I started from the futon is glued and ready to sand. At the moment I am leaning towards making it a pedestal table not a wall hanging but there is still plenty of time to change my mind. The top is approximately 10″x 14″ which is a a good size for a small pedestal table. I have been working on a small case piece for a few months now and I really need to commit to a finished design and move on. 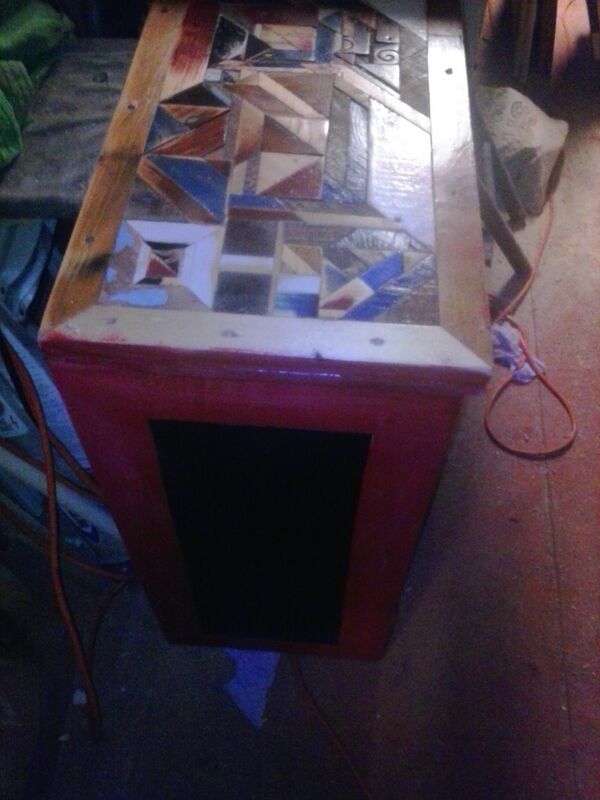 I painted the sides black and red, and the top is a mosaic piece lightly lacquered. 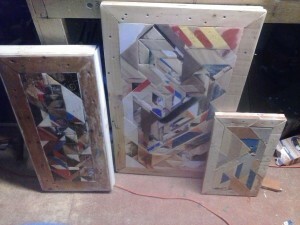 I made doors out of rough cut pine but I did not like the way they looked. I have experimented with leaving it open. I like the open look but sometimes you want a cabinet to close so you can hide things from view. I have a tentative idea for a simple pair of doors that won’t be too busy or distract from the top and if that doesn’t work I am out of ideas. Which means If I don’t add doors by May I am going to add some trim to the top, paint the interior black and red instead of just red and put it up for sale. The cabinet stands about 3 feet tall and is 2 feet wide and 1 foot or so deep. Thinking about it now, It could be modified into a desk without out too much fuss. I would take the shelf out add a soft close drawer bracket to the shelf and reattach it to the case piece. The back is just furniture grade plywood so cutting and screwing holes for wires and plugs is a small project. It might surprise you but if I did turn this into a desk I would add doors, a latch and a lock.Now I am rambling and there are things to build! 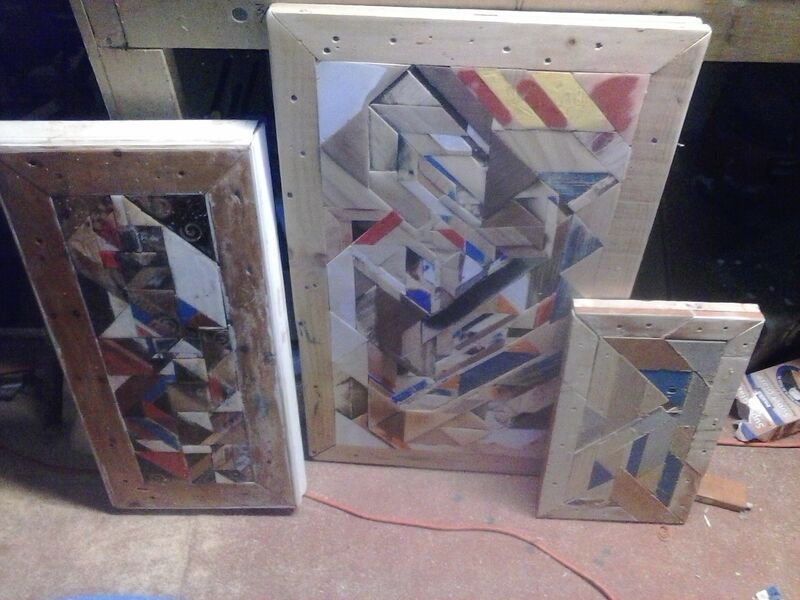 Pieces to sand and puzzles to layout. 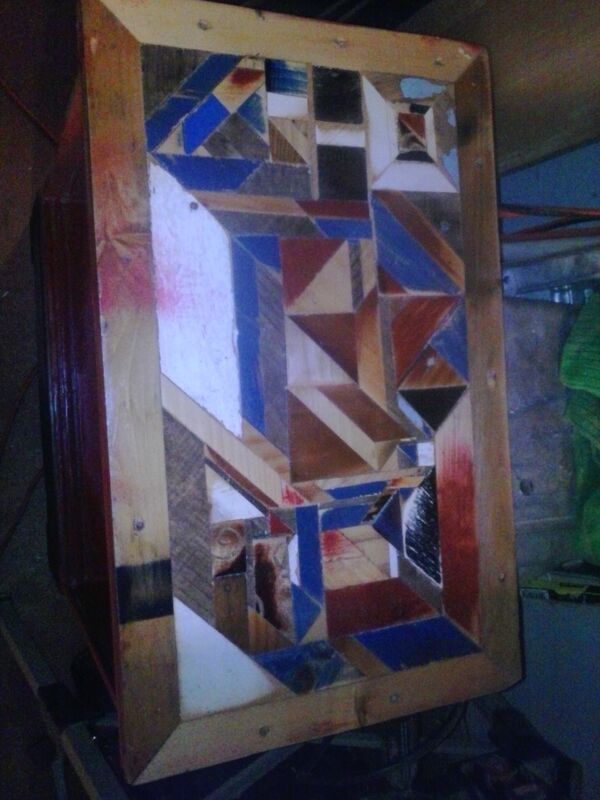 This entry was posted in barn board, for sale, old projects, repurposeing, scrap wood, tables by brighid. Bookmark the permalink.